This little booklet is intended to help parishioners grow in their understanding and appreciation of our eucharistic ritual so that they might participate more "fully, consciously, and actively" as Vatican Council II instructed. 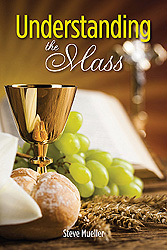 It provides an overview and an explanation of each of the parts of the Mass. It is not only a practical refresher for all parishioners, but is especially helpful for RCIA candidates, catechism groups and First Communicants learning about the Mass.